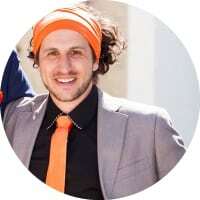 Jonathan Aufray is the co-founder and CEO at Growth Hackers. He helps startups, SMBs and fellow entrepreneurs grow with growth hacking and digital marketing. In the past 15 years, he has lived in 7 countries (France: where he is originally from, US, UK, Ireland, Spain, Australia and now Taiwan) and has done business with entrepreneurs from more than 70 countries. In his free time he loves meeting new people, traveling, discovering new culture and hanging out with friends. I have a large international experience and my background is very diversified. Because I am interested by many new things, all the time, Business Intelligence kind of came naturally when I started doing international business with African countries 10 years ago. I’d say I’m a good networker. People usually describe me as a positive, outgoing and friendly person. So, I guess this part of personality helps me network easily. For the little story, a couple of years ago I participated to a networking event and I won the ‘Best Networker Award’. Integration of AI is what’s going to disrupt most industries in the next 12-60 months.